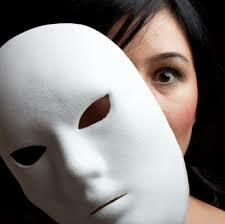 TAKE AWAY THE MASK - This attitude is like a mask, hiding the real person. Little Joe sat on the sofa unusually very moody since he came back from the Johnson's', three days ago, where he spent part of holidays; he found his home environment very strange. Strange because all he was confronted with were harshness, bullying here and there, complaints and threats. These, he was able to combine before now found it unbearable after his welcoming experience with the Johnson's where he was lavished with love and tender care. His frustration heightened and was aggravated by the fact that his mother who claimed to be a Christian presented two faces; a loving tender mother when dealing with outsiders, but a harsh, hard and impatient mother when dealing with her family members. As Joe brooded over this, his whole being longed for the kind of warmth and Peace that characterized the Johnson's. Regrettably, he saw this as a mirage in his own family home. "But why!" he muttered, "we go to church regularly like the Johnson's. Why are my parents not like them?" This situation in young Joe's life continued unnoticed by his parents, who remained loveless in their unkind treatment towards the children. One afternoon, as the parents left for the day's work, Joe packed his bag and baggage back to the Johnson's. The Johnsons who were not in anyway expecting him were taken aback. They however gave him a warm reception. After dinner, as Joe intimated them with his situation and agitations, he implored them to help instill in his parents those godly virtues that characterized the Johnsons. During their family altar, the Johnsons in very clear language explained to Joe the secret and source of their happiness and conduct. He was led to Christ and that memorable night, Joe embraced Christ as his Lord and saviour. Meanwhile at home, when his parents cane back to find him gone, they were panic stricken. Still in their perplexity, the phone rang. Both parents sprang up at the same time to answer the call. They were greatly relieved to hear from Mrs Johnson who informed them of Joe's safety in their arms and also invited them for a dinner chat. This meeting became a forum for Joe's happiness at home today. His entire family through the Johnson's welcomed Christ into their lives. Now, with Christ as the head of the home, young Joe's dream was fulfilled. The case of Joe can be described as a universal problem found in many homes today. Many Parents often have two faces. At home, with their children, they are harsh, serious, unloving and authoritative. When found with outsiders or with other children, they appear more humane, tender, kind, patient, courteous and loving towards them. This attitude is like a mask, hiding the real person. Parents are admonished to remove it and be at home what they are outside.